Chelan Butte, at the eastern tip of Lake Chelan in eastern Washington, is arguably the premier XC site in Washington. The Butte has a world-wide reputation for big air and long-distance potential during the summer season, and has been the location of several national and international paragliding and hang gliding competitions. 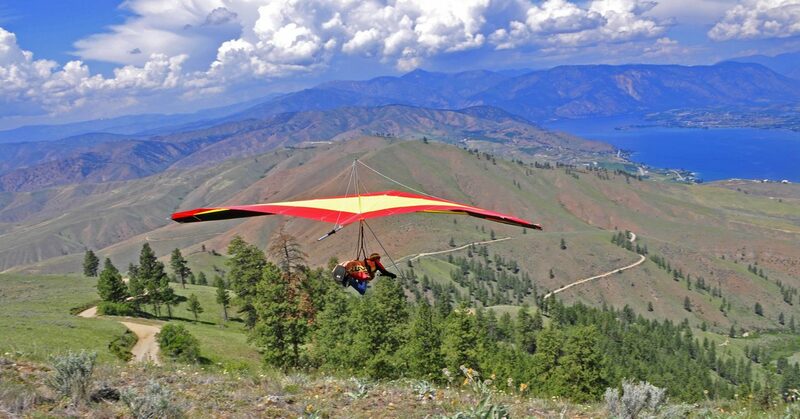 Several hang glider pilots, on both flex and rigid wings, are members of the "Spud Club" – those who have flown into Idaho from Chelan. In spring and fall, flying conditions at the Butte are often quite mellow, drawing good crowds of hang glider and paraglider pilots to the Beach'N, Fly&Bike, and Women's Halloween fly-ins each year. The site is collaboratively managed by Chelan Flyers with help from members of CBCC and NWPC. Any pilot planning to fly Chelan Butte should refer to the Pilot Information page at FlyChelan.com for the official site protocol and pilot information. Tom Johns 425-941-9836 or Lori Lawson 425-681-2458. Access: 2WD is usually okay, very treacherous after rain, 20 minutes to top. Notes: Beware of dust devils!! Notes: Very thermally!! Expect turbulence when landing midday; do not land in mature crops (gold fields) or orchards, or on the "three fingers" on the lake shore. Additional Notes: Launch is owned by DNR; all vehicles driving to launch MUST carry a shovel and minimum 10BC fire extinguisher. No smoking on launch. Ridge soaring is possible early mornings and evenings, otherwise this is a big thermal site. LZ is not visible from launch. Major XC site, location of '85, '86 & '95 U.S. Nationals and '94 Women's World Meet. Also home to the annual Chelan XC Classic. Chelan Butte is a self-funded site. It continues to be available for both Hang Gliding and Paragliding flights through generous contributions from pilots who fly there – both local and visiting pilots. Fund-raising meets are one way to donate. Another way is simply through the CBCC website via Paypal using the “donate” button. Another way is to send in a personal check to CBCC via snail mail at the Club’s post office box. Please mark on your check, “Chelan Butte Fund”. As far as what amount is appropriate, well that’s up to you. Perhaps if you fly there up to 10 flights a year, considers a donation amount of $10 per flight. If you fly more than 10 flights a year then perhaps $5 per flight would work.